Celebrate Frozen Food Month by entering the Smart & Final Escape the Cold Sweepstakes at SmartAndFinalEscapeTheCold.com and you could win a trip to Hawaii for two. Participate by purchasing participating frozen food items at Smart & Final and enter your receipt code online at smartandfinal.com/escapethecold. 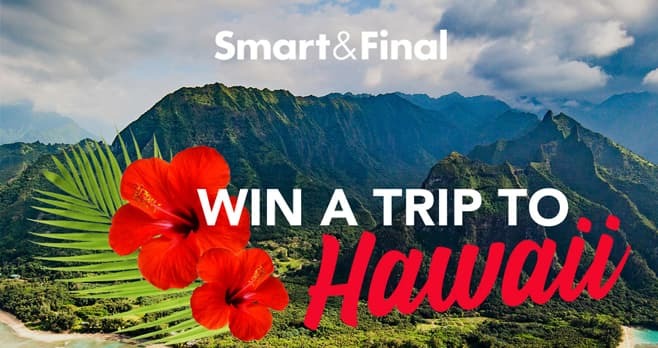 The Smart & Final Escape the Cold Sweepstakes is open to legal residents residing in the states of: Arizona, California and Nevada who are 18 years of age and older at time of entry. The Sweepstakes begins at 12:00 a.m. PT on 3/6/19 and ends at 11:59 p.m. PT on 4/2/19. The grand prize consists of one (1) trip to Kauai, Hawaii for 2 persons not to exceed $5000.00 in total value. Visit www.smartandfinalescapethecold.com to enter and see Official Rules for details.